Qormi revived hopes of avoiding a quick return to Division One as they stunned Hibernians, beating them 3-1. Hibernians went in search of an early goal and Marco Sahanek tested David Cassar with a long-distance freekick on 10 minutes. However, five minutes later, Qormi took the lead as Yannick Yankam headed the ball home off a corner from the left by Antonio Rozzi. The Paolites restored equilibrium on 18 minutes. Sahanek’s corner from the left created havoc inside the area with Andrei Agius hitting home from close range. Andrei Agius went close once again on 24 minutes with a direct freekick which was tipped into a corner by Cassar. From the resulting corner by Sahanek, Taylon’s close range effort was parried by the Qormi goalkeeper. Three minutes from the end of the first half, Sahanek was unlucky to hit the upright with a curling shot from the edge of the area. 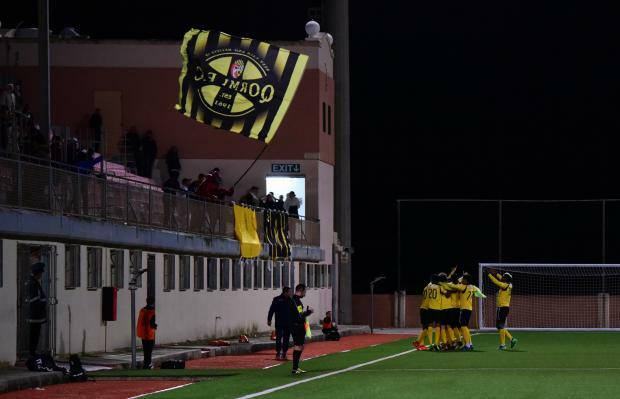 However, one minute in added time, Qormi regained the lead when off an assist by Yannick Yankam from the left, Antonio Rozzi slotted the ball past Jovicic. Ten minutes in the second half, David Cassar performed another great save on a Sahanek freekick. Agius then headed the ball wide off a freekick by Sahanek from the right on 63 minutes. The Austrian striker was prominent once again for the Paolites, hitting the crossbar direct from a corner on 72 minutes and hardly a minute later, another cross shot by Sahanek was blocked by the Qormi goalkeeper. Ten minutes from time, Tensior Gusman was given marching orders by referee Stefan Pace after receiving a second yellow card, leaving his side in ten men. However, one minute from time, Qormi sealed the issue with a third goal. Mohamed Bangoura concluded a good move on the left flank with a diagonal shot which gave the Hibernians custodian no chance. Yannick Yankam was named BOV Player of the Match.